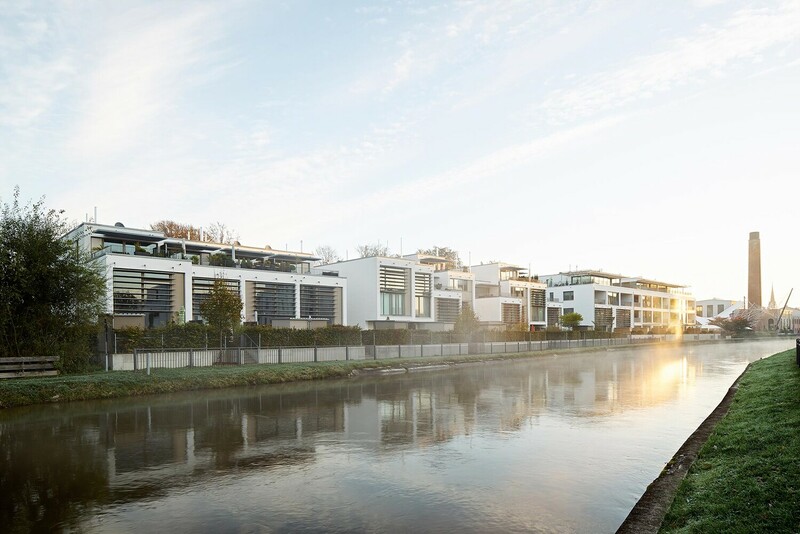 The building is situated directly by the Mangfallkanal in Kolbermoor with a panoramic view of the Alps in the south and the Spinnereipark in the north, surrounded by historical industrial monuments. It thus profits from its unique location, which significantly determines the living quality and can be experienced by every inhabitant. The different apartment sizes between 90 m² and 230 m² and the functional structuring, which can easily be adapted to individual wishes, offer the possibility of addressing a broad scope of different lifestyles. The apartment’s two-sided orientation provides an optimal justification of the rooms: In the central zone are the entrance area, the bathroom and a lavatory. The sleeping area is located on the northern side with a view on the Spinnereipark and the living area, with its open, loft-like character is oriented to the south, which offers a view towards the canal and the Alps. The ten patio apartments have a secured Loggia in the south which connects the interior and the exterior. In the middle zone of each apartment, a patio, which is covered by a light dome, extends over two or three levels. It provides an additional lighting of the living rooms and the bath rooms and offers an area with a special living character. The two maisonette apartments extend over two floors. This enables generous two-storey living areas with a gallery level, which opens up through an extensive glazing towards the garden belonging to the apartment. 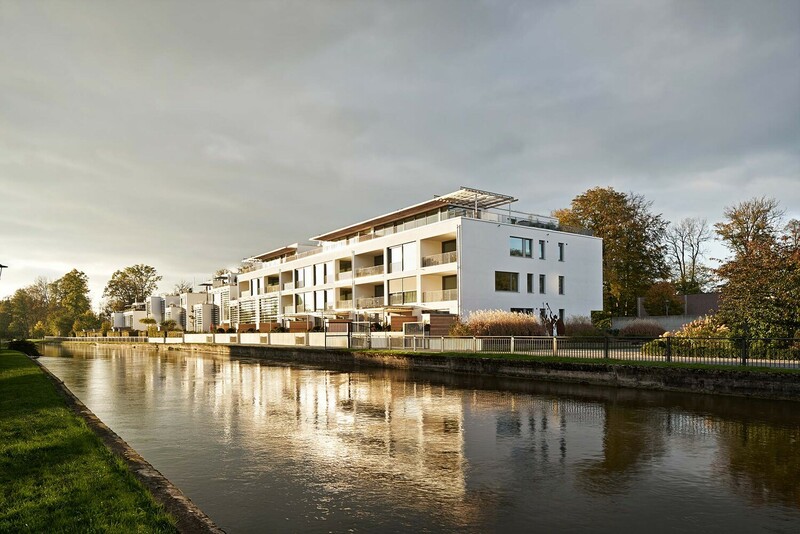 The living rooms of the three penthouses on the roof are glazed room-high on two sides, thus offering a panoramic view on the canal, the Spinnereipark and the mountains. Broad roof terraces extend the interior to the outside. 5.031 qm / 54,153 sq.ft. 16.097 cbm / 568,500 cu.ft.